Lighting design is not always about high-traffic areas, like the family room and kitchen. Essential task areas need proper lighting too. When it comes to lighting design, spaces not typically seen by guests sometimes do not get the attention they deserve. Household jobs are easier to tackle in an organized, well-lit space. The laundry room, for example, requires adequate task lighting to be most functional. It is important to make sure this room lighting does not have distracting glare and shadows, which can cause eye strain. Under-cabinet lighting may help illuminate darkened areas. And, an overhead light source is a must. After all, the right laundry room lighting can mean the difference between having bright white sheets or pinkish sheets (due to one unseen red sock). Visit your local Hortons Home Lighting retail store to see lighting options for your laundry room. Lighting in the bathroom takes dual consideration. Bathroom lighting should be both hardworking and mood enhancing. For example, to create a relaxing, spa-like experience – or for late-night visits to the bathroom – a dimmer is a necessity. Easy-to-install toe-kick lighting is a good place for lights that can be dimmed. On the other hand, daily grooming tasks, such as makeup application or shaving, require brighter, focused task lighting, such as a light bar above a mirror or sconces on each side. 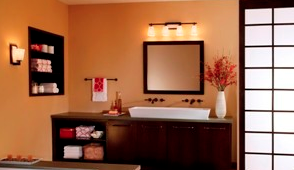 Bathroom lighting fixtures should include bright bulbs for vanity lighting without harsh glare. Both fluorescent and LED light sources are very appropriate for vanity lighting, and are available in a variety of color temperature options. Use either 2700K or 3000K to simulate the look of incandescent lighting. It is also important to select a fixture with a light source that has a Color Rendering Index of 80 or higher. To evaluate the color, look at a fixture while it is turned on in a lighting showroom before making a buying decision, whenever possible. Learn more about perfect bathroom lighting at a nearby Hortons Home Lighting store. Is it safe to put a chandelier above a bathtub? Only if certain requirements are met. It is only safe to place a chandelier above a bathtub if the bottom part of the chandelier is 8 feet or more above the water line or the rim of the tub. This is a requirement of the National Electrical Code. The code states that no part of a chandelier shall be less than 8 feet above the water line or rim of the tub.